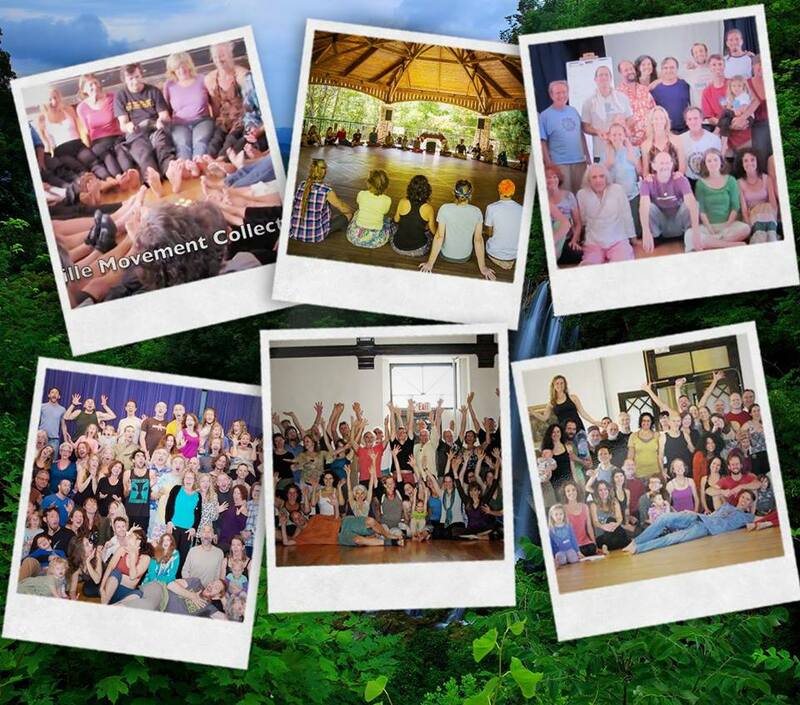 The Asheville Movement Collective vision of “a world that moves in harmony” was born in 2009. We have been moving together since the year 2000. During this time, we have gone through many transitions. We have adopted Dynamic Governance, become a 501c3 educational nonprofit, changed leadership, and moved venues multiple times. When I started dancing in 2009, the Sunday dances were at the Art Center on Merrimon. It was so packed, we could barely raise our arms. We started holding 2 waves in 2009 to make more space for dancers, but the place was still too small. We then moved to Studio 11 until the parking was lost when nearby land was developed. The Masonic Temple was our home from 2012 until 2017 when we moved our Sunday dances to the JCC. Over the years since AMC began holding Friday night dances, we have held Fridays at 3 different Terpsicorps Studios venues and the Asheville Ballet in between, as well as at NYS3 studios. Through all the hurdles, AMC has faced, we kept dancing and growing. AMC is a 100% dancer organized nonprofit, and every dance that happens is with the help of dancer volunteers, who have allowed us to host more than 1000 dance waves for personal and community transformation since 2009. Now we are at another milestone. After October 14th, when the Asheville Jewish Community Center completes their renovation, the gym will be used for special activities and no longer available to us. The center has been very welcoming and has made us feel at home while we were there. We are very thankful for the opportunity to dance there. We continue to look for both a more permanent home, and more suitable interim spaces. Warren Wilson College Bryson Gym for one extended wave on Sunday, October 28th from 10am – 12:30pm. the Evergreen Gym will host our Sunday dances from November through the end of December. We are continuing the search for more ideal dance spaces. The venue changes over the years have been a significant challenge for AMC, and suitable and affordable dance venues for a dance of our size are difficult to find in Asheville. In our search for a space for the Sunday dances, we have found that event venues that are large enough for our second waves and have plenty of parking are rare, and very expensive. A longer term lease makes spaces more affordable per hour, but comes with host of other costs and responsibilities, and would entail developing more robust income sources to support the cost of the monthly lease. Since finding a suitable Sunday-only venue is proving increasingly difficult, AMC is exploring creating not just a permanent home for our community’s dance waves, but also a community-led dance space for the greater Asheville movement community. While the costs of renting, building out and maintaining, managing a space, and booking the use of the space are significant, we believe the Asheville movement community and our dance collective may be ready to create a dedicated home for itself!The project is still in its seed stages, honing our research, plans and developing our networks, but AMC will need the community’s support to be able to continue this movement practice we all love! We are making this happen together. Will you join in community to create the world we want to see? What do you think? How do you want to help! ?